Like transcription, translation is controlled by proteins that bind and initiate the process. In translation, the complex that assembles to start the process is referred to as the initiation complex. The first protein to bind to the RNA to initiate translation is the eukaryotic initiation factor-2 (eIF-2). The eIF-2 protein is active when it binds to the high-energy molecule guanosine triphosphate (GTP). GTP provides the energy to start the reaction by giving up a phosphate and becoming guanosine diphosphate (GDP). The eIF-2 protein bound to GTP binds to the small 40S ribosomal subunit. When bound, the methionine initiator tRNA associates with the eIF-2/40S ribosome complex, bringing along with it the mRNA to be translated. At this point, when the initiator complex is assembled, the GTP is converted into GDP and energy is released. The phosphate and the eIF-2 protein are released from the complex and the large 60S ribosomal subunit binds to translate the RNA. 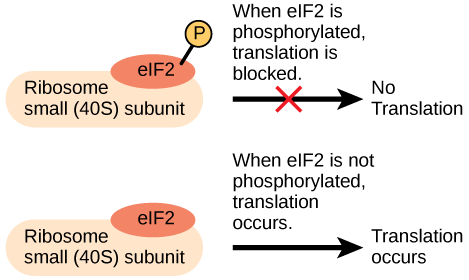 The binding of eIF-2 to the RNA is controlled by phosphorylation. If eIF-2 is phosphorylated, it undergoes a conformational change and cannot bind to GTP. Therefore, the initiation complex cannot form properly and translation is impeded ([link]). When eIF-2 remains unphosphorylated, it binds the RNA and actively translates the protein. The addition of an ubiquitin group to a protein marks that protein for degradation. Ubiquitin acts like a flag indicating that the protein lifespan is complete. These proteins are moved to the proteasome, an organelle that functions to remove proteins, to be degraded ([link]). One way to control gene expression, therefore, is to alter the longevity of the protein. Post-translational modifications of proteins can affect which of the following? Protein modification can alter gene expression in many ways. Describe how phosphorylation of proteins can alter gene expression. Because proteins are involved in every stage of gene regulation, phosphorylation of a protein (depending on the protein that is modified) can alter accessibility to the chromosome, can alter translation (by altering the transcription factor binding or function), can change nuclear shuttling (by influencing modifications to the nuclear pore complex), can alter RNA stability (by binding or not binding to the RNA to regulate its stability), can modify translation (increase or decrease), or can change post-translational modifications (add or remove phosphates or other chemical modifications). Alternative forms of a protein can be beneficial or harmful to a cell. What do you think would happen if too much of an alternative protein bound to the 3′ UTR of an RNA and caused it to degrade? If the RNA degraded, then less of the protein that the RNA encodes would be translated. This could have dramatic implications for the cell. Changes in epigenetic modifications alter the accessibility and transcription of DNA. Describe how environmental stimuli, such as ultraviolet light exposure, could modify gene expression. Environmental stimuli, like ultraviolet light exposure, can alter the modifications to the histone proteins or DNA. Such stimuli may change an actively transcribed gene into a silenced gene by removing acetyl groups from histone proteins or by adding methyl groups to DNA. Eukaryotic Translational and Post-translational Gene Regulation by OpenStaxCollege is licensed under a Creative Commons Attribution 4.0 International License, except where otherwise noted.